Gary Griggs received his B.A. in Geological Sciences from the University of California Santa Barbara and a Ph.D. in Oceanography from Oregon State University. He has been a Professor of Earth Sciences at the University of California Santa Cruz since 1968 and Director of the Institute of Marine Sciences since 1991. His research and teaching have been focused on the coast of California and include coastal processes, hazards and engineering, and sea-level rise. Dr. Griggs has written over 175 articles for professional journals as well as authored or co-authored eight books. In 1998 he was given the Outstanding Faculty Award at UC Santa Cruz, and the Alumni Association honored him with a Distinguished Teaching Award in 2006. The California Coastal Commission and Sunset Magazine named him one of California’s Coastal Heroes in 2009. From 2010 to 1012 he served on the NAS-NRC Committee on Sea-Level Rise for the Coasts of California, Oregon and Washington. 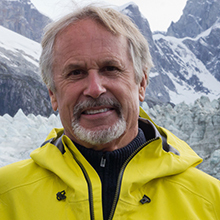 He has also served on the Ocean Protection Council’s Science Advisory Team since 2008. In 2010 he was elected to the California Academy of Sciences.